Timid Fingers: Call or Chat? Obviously Chat!! There are many products at home that we wish to replace or not use and simultaneously there are many others which we need to buy but are very costly. In such cases, Quikr.com is always my first preference when it comes to buying or selling products. Quikr.com is very helpful even when we want to find jobs. Whenever I search for a compatible job on the internet, the first link that comes on my screen in all search engines is of Quikrs’. One thing that always remains a drawback of the whole process is the visibility of our phone number. Getting annoyed by fake callers has become a regular problem for me and there is no way I can dodge that problem even after trying so much. To solve this only drawback, came into view Quikr Nxt, which changed everything. And when the IndiBlogger team asked us to blog about the advantage of chatting over phone call, it became like a cake walk for me. The first reason of why chatting is better than a phone call is, I can keep a track on the conversation. Like, I cannot record every important call to re-listen to the conversation whenever needed but I can always see the chat history in case of emergencies. The second immediate reason that comes in my mind is, I can chat anytime but can't talk every time. I have faced this problem earlier. Suppose, you are travelling in a train and when an important call comes of a prospective client or buyer you are not able to hear anything because of the continuous honking of the train. But you can always chat while you are seated on a window seat of a honking train or in a car standing at a traffic signal. Chatting is better than phone call because I can share photos and this is the third reason. Earlier, if someone used to ask for a photo of the product or its features on phone, I used say that I will mail him/her the same and that meant some extra effort and it was even time consuming. But while on a chat with the prospective client, I can send photos straight away without any delay and can even look at them later on. These are a few reasons why chatting is way better than phone calls. I can give at least five more reasons for the same. 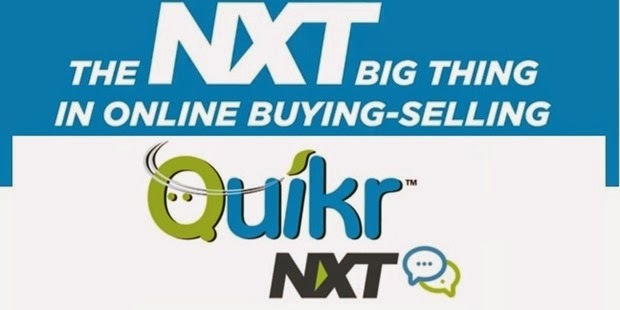 I think Quikr Nxt is possibly the best thing that could’ve come in the mind of the developers till date. I am immensely impressed by this application and I can easily say other users will also find this helpful. This application is heartily recommended by me to all the other users who want to get benefitted from the uses of Quikr.com and Quikr Nxt. Note: This article is a part of http://www.quikr.com/.